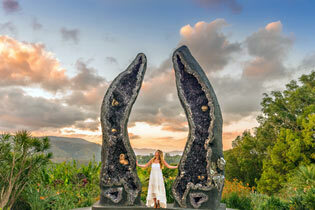 Gold Coast, Tamborine Mountain region of New South Wales, NSW and Queensland, QLD, Australia. 13 luxurious totally secluded, self-contained, private cabins, bungalows and lodges hide among the trees. 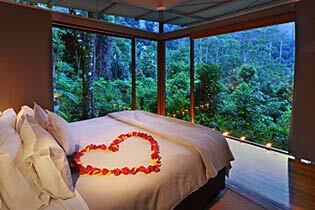 Each bungalow has a king-sized bed, fully equipped kitchen, TV/stereo, and double spa bath overlooking the rainforest. An alaphabetical list of customers and advertisers, and community supporters sponsored by Big Volcano. Mostly holiday accomodation, day tours, activities and attractions, and retail and services links, in Byron Bay, Murwillumbah, Ballina, Kingscliff, Tweed Heads - Northern Rivers region of New South Wales, NSW, and Gold Coast hinterland, Tamborine Mountain area of South East Queensland, QLD Australia. Houseboats are fun, easy to manoeuvre, and anyone over 18 can legally captain one with no license required. Take a step away from the norm and make your next getaway, well, actually a getaway! Explore the Gold Coast Broadwater as captain of your own ship. We have the largest most modern fleet of 4-12 berth houseboats and cruisers available, covering the beautiful Gold Coast and Lower Moreton Bay waterways. Just thirteen architect designed, luxury self contained individual, bungalows, cabins and lodges all with fireplaces, double spa baths and rainforest views, are discreetly located for privacy and views. In the heart of Kingscliff, we offer ocean view spa studios with double spa baths, or 2 and 3 bedroom fully self contained family apartments (3-6 people), with gourmet kitchens, quality appointments and ocean views from the balconies. A working cattle farm on 400 acres situated beneath the spectacular escarpment of the World Heritage listed Nightcap National Park, between Byron Bay and the Gold Coast. Midginbil Hill is the ideal budget getaway for a country style barn wedding where all your guests can stay in accommodation on the property and have a great three day party. Hosanna offers a range of affordable accommodation options including comfortable cabins, "safari huts" to suit families, couples and singles, and a camping ground. Facilities include communal lounge, kitchen and dining area, laundry, internet access, and a wood fired sauna next to our swimming and kayaking dam. And we're dog friendly! Day visitors welcome - $. Ideal for a couple or solo adventurer. Just 5 minutes drive to Pottsville Beach. From $95 pn. 2 night min. Sleeping 6 comfortably Mango Tree cottage is fully furnished self contained holiday accommodation boasting 2 bedrooms and sunroom with sofabed. Equipped with everything you need to unwind, relax, and recharge yourself, including complimentary organic personal care products, fluffy bathrobes, and bath salts/gel. We are kids, wheelchair, and pet friendly. From $175 pn. 2 night min. Open 7 days* from 10am-5pm, and home of the biggest and most beautiful crystals in the world. Explore the Shambhala Gardens and rainforest. Find yourself in an ancient labyrinth, and visit the only Kalachakra World Peace Stupa in the southern hemisphere. Join in free daily workshops and experiences. Enjoy views, local coffee and delicious food at the Lotus Cafe, and discover your own special crystal in our showroom and gallery. Day, Month & Annual Passes from $22, direct online. Entry includes your own 128 page Crystal Castle Guidebook. *Closed Christmas Day, Boxing Day and Good Friday. The museum is open daily from 9am to 4pm, EAST, except Xmas Day, Boxing Day, Anzac Day and Good Friday, with a large collection of naval and maritime memorabilia: a full size La Balsas raft which succesfully completed a trans Pacific voyage from South America, and many other interesting displays. After a multi millions dollar upgrade and expansion, the former Tweed River Historical Society Museum is now open to visitors. Displays showcase the patterns of settlement, industry and agriculture that have shaped the Valley, and provide insights into contemporary life in the Shire. A NSW NPWS Historic Site, the Centre has a museum, and a shop offering aboriginal art, crafts and souvenirs. A mangrove boardwalk and walking track winds through the site, to an amphi-theatre. The shop and museum are open Monday to Friday, 9am-3pm. Learn how to maintain and improve your eyesight with Natural VISION Improvement techniques which have proved effective worldwide. Workplace and Weekend Workshops, Classes and Private Sessions available. We assist in control and removal of pigeons and feral birds, from enclosed areas like shopping centres, warehouses, high roofed buildings and under roof areas, in Brisbane and surrounding areas.